Growing up my mother was obsessed with high tea. She collected tea cups, tea pots and hosted tea parties at our house. These weren't little parties either. She would spend hours making tea sandwiches, cookies and most importantly scones. Everything always had to be just right. These were also not jeans and t-shirt affairs. My mother would sew me beautiful dresses to wear to these parties, spending hours making sure everything was just right. As I got older we would spend hours at second hand stores looking for vintage dresses and coats. Then we would dress-up and go to high tea at the Four Seasons in downtown Seattle. It always felt so special and fun and I loved spending the time with my mother. One of my favorite memories of my mom was when I was able to pay for an entire trip for the two of us to Victoria, BC. I was in college and working more than part-time. I saved up as much money as I could after rent etc. and paid for the entire trip. We had a great time and the highlight was tea at the Empress Hotel. It was perfect, the food, atmosphere and most importantly the happiness reflected on my mom's face. I love these memories and every time I make scones for my children I remember my mother. 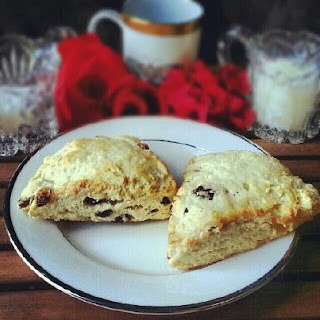 Recently I tried a new recipe for Cream Scones from Everyday Food magazine, which I hoped would be as good as the ones my mother made growing-up. This recipe has 8 ingredients. It takes 25 minutes of total time, 10 minutes of which is active and makes 6 servings. I did make one major modification. The super store in my area has decided to stop carrying currants, so instead of going to another store I substituted dried pomegranates. The only other change that I made was to use organic butter, I prefer organic butter, eggs and milk, especially for my two boys. I chose not to add sanding sugar to the top of the scones, I prefer the taste without it. Finally, make sure to rotate the pans halfway through the baking time to ensure even browning. I followed the remainder of the recipe as written. These scones turned out very well. They had a nice flaky texture and the dried pomegranates worked perfectly. While I love currants, I thought substituting pomegranates was a nice change from my usual routine. I enjoyed my scone with a cup of coffee and it was delicious. Perfect for afternoon tea (or coffee) or anytime of the day. For the recipe go to Cream Scones. What a lovely and touching post, Frugal. I can understand your mother's obsession with high tea, it is a grand and innately feminine experience. I agree it definitely is innately feminine! The pomegranates are yummy :) If you try the recipe tell me how it turns out!